NOTE: This article was originally published as a post in the .NET and Memory blog (by Andreas Suurkuusk, co-founder of SciTech Software AB). A while ago we received a support request from a customer that had a memory leak in his application. After showing, closing and disposing an MDI child form, the Form instance was still alive. The root path indicated that the child form instance was kept alive by the MDI parent, via the internal propertyStore field. I tried to reproduce the problem using an MDI application that was easily available: the Game of Life application used in the .NET Memory Profiler tutorials. 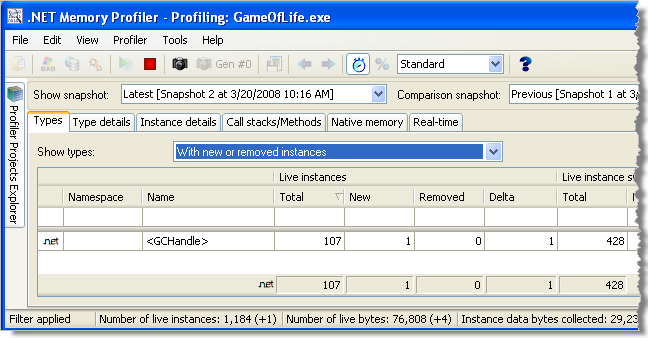 And to my surprise the Game of Life application had a memory leak, even after the memory leak fix in the tutorial had been applied. After having collected the last snapshot in the second .NET Memory Profiler tutorial (after closing the Game of Life MDI window), there should be no new instances of any type (since the memory leak should have been fixed). Thus if the type filter is set to only show types “With new or removed instances”, the Types list shold be empty. If the original version of .NET Framework 2.0 is used, this is almost true. A single new <GCHandle> instance will exist, but for now I will ignore this (it will be discussed in a future post). However, testing the tutorial after having installed .NET Framework 2.0 SP1 shows completely different results (as can be seen in the picture below). Even though no additional instances have been created (Delta is 0), there are still a lot of New and Removed instances. At the time of the last snapshot, no Game of Life windows are open, so I would expect all LifeForm instances to be GCed, but there’s still one new live instance left. So the new LifeForm instance is a good candidate for memory leak analysis. The details of the new LifeForm instance is shown in the picture below. Most of the text in this post is copied from my reply to a forum question at http://forum.memprofiler.com/viewtopic.php?t=1160 . In the forum I said that the problem was introduced in .NET Framework 3.5. However, installing .NET Framework 3.5 will automatically install .NET Framework 2.0 SP1 and .NET Framework 3.0 SP1, and the memory leak exists in the .NET 2.0 assembly “System.Windows.Forms.dll”. Unfortunately, this problem affects the .NET Memory Profiler tutorials. When we get the time to update them, we will have to take this into consideration. 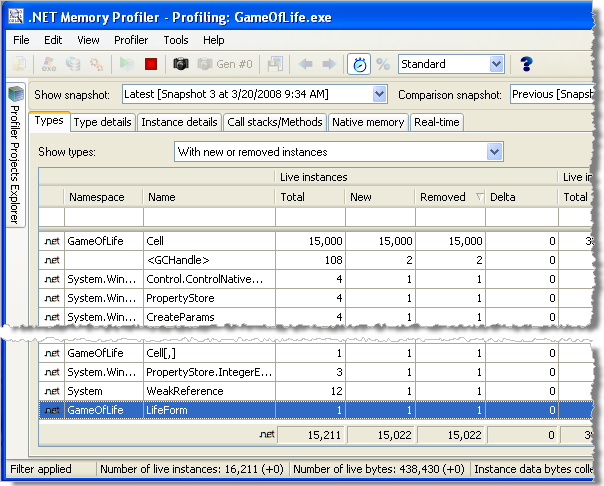 Download .NET Memory Profiler to see how it can help you find memory leaks and optimize memory usage in your application.